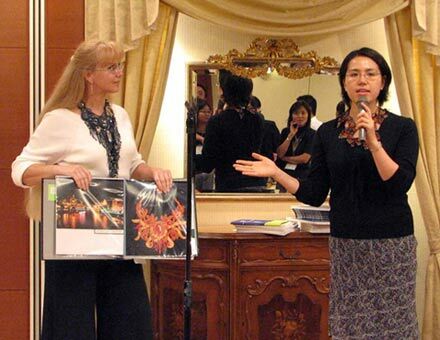 I would like to introduce you to Tatiana Van Iten, an outstanding jewelry designer from the USA whose works have won several beading contests. Tatiana uses a wide variety of materials, including very small (up to size 22*) seed beads, freshwater pearls, glass and wooden beads, leather, feathers, gemstones and fossil specimens, including pieces of wooly mammoth tusk. The fossils that adorn her necklaces range from 10,000 to 400 million years old. Tatiana, when did you start to work with seed beads? I started beading a long time ago. I do not remember when exactly, but I know I was approximately six years old, because I already could read but I still did not go to school. My grandmother taught me how to make bead embroidery, and I helped her to repair small religious objects for the underground church in the former Soviet Union. The old seed beads were so small and delicate that I would have to make a stitch, unthread the needle, thread the bead onto the thread, and then rethread the needle to complete the stitch. Because my grandmother could not do this work herself – her big fingers could not feel such tiny beads – she just sat down next to me watching and reading to me stories from the Bible. My grandmother also taught me how to spin yarn and knit, and my mother taught me how to sew and embroider. I taught myself tatting and crocheting. For as long as I can remember I always tried to make something very special for myself and my sister. For my prom night I made a white dress with seed bead embroidery in just three days! I graduated from the Leningrad State University with a Master of Arts degree in photojournalism. Twenty-one years ago I married an American paleontologist and then moved to the United States. Now I am a free-lance photographer and I also teach beading classes at bead stores and bead shows. What was the most important event for you in 2006? Recently my husband and I returned from a week-long trip to Japan, where we were guests of the Japanese TOHO BEADS COMPANY. Several months ago this company and the American company, TAMBROOK BEADS AND TRADE, held their TREASURES of TOHO BEADING COMPETITION. 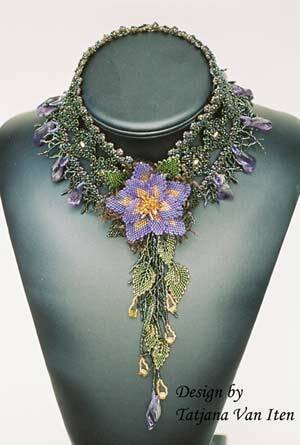 My necklace, named “Forest Dragon's Tears”, won the grand prize in the Wearable Art category. This is a picture of my prize-winning work. Who else won in this competition? All of the Grand Prize winners (four categories) received two roundtrip plane tickets to Japan. Sisters Sue Jackson and Wendy Hubick won the Non-Wearable Art category with a very elegant black Evening Bag. Christina Manes won the Sculptural category with her amazing dragon, Ishtar (with a nearly three-foot-long wing span). I was also very impressed by the work of Judy Walker, winner of the All AIKOs category. Her Three Ivory Spheres – one inside the other – truly is a masterpiece! Japan is a fascinating and beautiful place, quite unlike any other country I have ever visited. I had the impression I had landed in a fairy tale. Tall misty mountains covered with dense forests and surrounded by the ocean. Bridges and tunnels; shrines and parks; enormously big cities (you never know where one ends and another one starts) – we will treasure these memories forever. The people of the TOHO BEADS Company were wonderful. They treated us like royalty. 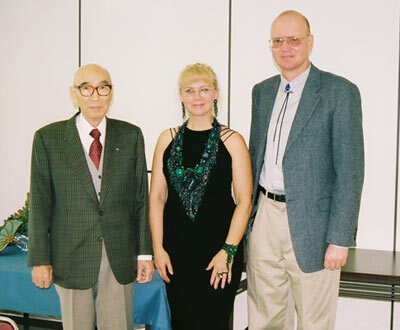 The central office is in Hiroshima ; there we met the founder and president of the company, Mr. Yamanaka. Did you have a chance to see how they produce the seed beads? The TOHO Bead Factory is located in the Garasu No Sato ( Glass Village ) near Hiroshima . In addition to the factory there several museums, glass and hand craft studious, shops, restaurants and gardens for tourists, who visit this place very often. We were impressed by how clean the factory is. The process of making seed beads is partly automated. The result of this is that all the beads have absolutely the same size and shape, and so woven pieces made from these beads look and feel like heavy antique silk. The best TOHO products are their AIKO BEADS, named after Mr. Yamanaka's wife. The seed beads come in over 1000 colors, and the colors are very resilient; they do not fade or scratch off. Best of all, TOHO seed beads have a bigger hole than any other beads. For this reason, it is much easier to work with TOHO beads on the loom or to do knitting and crocheting. And TOHO beads are especially nice for people with poor vision. Tatiana, what kind of beads do you prefer to work with? In terms of quality, I think Japanese seed beads are the best in the world. I myself am not very picky; I can work with anything if it matches my idea. For example, I like to work with good Czech seed beads, especially with sizes 15* - 17* when I am making leaves. For the veins inside the leaves I use even smaller beads (size 20* - 22*). Sometimes I use irregular Chinese seed beads to make a rough surface with a very interesting texture. Unfortunately, these beads are very fragile and break on the needle. When making a large necklace I try to use light-weight beads because the gemstones and fossils I use are fairly heavy. Of course, I have to use wire, for example SoftFlex wire, for support. I also like to combine wooden, bone and horn beads with antique Bohemian seed beads and Swarovski crystals. And why not? It is my necklace and I can do whatever I want! I often use several different techniques in the same work. 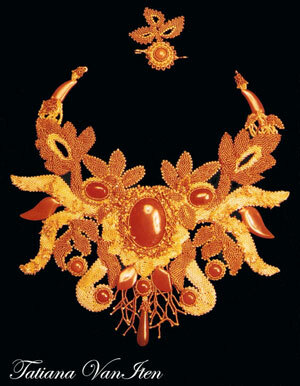 These include the multilevel Russian technique (Ludmila Bozhko), bezeling cabochons (Sherry Serafini and Dustin Wedekind) and flowers and butterflies (Huib Petersen). All of these techniques I modify in the process of making my work. How many contests have you won? I participate in contests because they are a very good way to show my work to other people and to move forward in the world of beading. Three years ago I applied for permission to teach beading classes at an art center. My application was rejected because my name was not well-known, and I was advised to try to publish my work or to enter some contests. Since then I have won eight first places and one second place, and I have been a finalist several times. 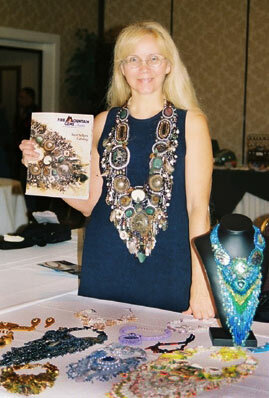 I have also published a lot of my work in magazines, and thanks in part to this publicity I now teach beading classes at major bead festivals. 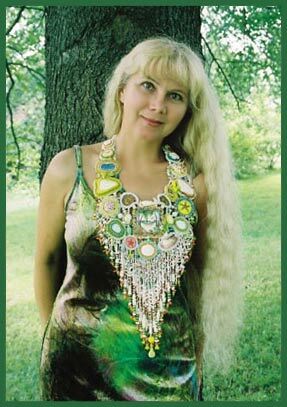 Shown in the picture is my necklace “Arbel”, which was the Gold Medal winner in the seed bead category of the “FIRE MOUNTAIN GEMS AND BEADS” 2003-2004 CONTEST. The necklace is named in honor of Arbel Shemesh, who works for this company. My new life in the Beading World started with her phone call message informing me that I had won my first contest. 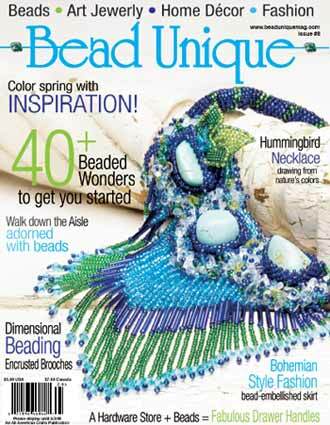 In the picture below is my Hummingbird Necklace on the cover of my favorite “Bead Unique” magazine, where I have published several of my works. I always keep in mind the words of the famous Russian writer, V. Tokareva, about the three levels of creativity. At the first or lowest level your work is very primitive owing to insufficient imagination and poor execution. At second level your work is very complex because you can do a lot of things and you really want to show people what you can do. At the third or highest level your work again is simple, but now because your idea is pure and elegant and your execution of it is excellent. At present I think I work mainly at the second level, but I hope I will soon be working at the third level. I am also writing a book showcasing some of my best photographs and the necklaces they inspired. Tatiana, what do you do besides beading? Basically I am a housewife. Also I work part-time as a martial arts instructor in a local gym (I have a second degree black belt in Kung Fu).